Discover an adventure at your local library! Museum Discovery Passes are available on a first come, first served basis at most Public Library locations. They can't be placed on hold by computer or phone, so please visit your local library to choose today's adventure! 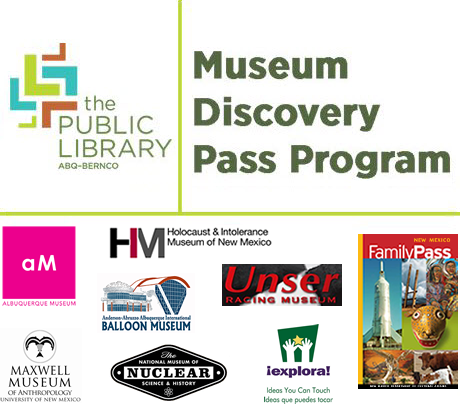 The Public Library Albuquerque and Bernalillo County is pleased to offer local museum family passes for check out. This program is designed to engage adults, children and families in art, history, science, technology and literacy learning. The Museum Discovery Passes are made possible through the Library’s materials funding and donation of Passes from some of the Library’s partners in the program. The Museum Discovery Passes are offered at all branches of the Public Library except for the Special Collections branch. Museum passes may be checked out by adult cardholders with full access accounts in good standing. Museum Passes check out for 7 days and may not be renewed. Only one Museum Pass at a time may be checked out by a family. Each Pass generally allows 2 adults and 2 children free entry to the museum of choice, exceptions are noted on the Pass. Albuquerque International Balloon Museum - Passes available through September 30, 2019. Albuquerque Museum of Art and History - Passes available through August 31, 2019. ﻿¡﻿Explora! - Passes available through August 31, 2019. Maxwell Museum of Anthropology - Passes available through August 31, 2019. National Museum of Nuclear Science & History - Passes available through August 31, 2019. New Mexico Family Pass - Visit any of 15 state museums and historic sites throughout NM. Passes are active. Unser Racing Museum - Passes available through December 31, 2019. Make sure to check-out and return the museum pass to the Service Desk at your branch library. You may only return a Pass to the branch library where you checked it out. Please do not put museum passes in the library book drops; this could result in loss of the pass and significant costs to you, so please check the hours of the location to make sure you return the pass while we are open. Borrowers agree to reimburse the library $25.00 for lost or stolen Passes. After returning the New Mexico FamilyPass, we ask that you complete a survey so that we can accurately measure the impact and success of the FamilyPass program. Click here for the FamilyPass survey!